The first Milk Mama Diaries Carnival last March was a huge success! As previously explained, the Carnival will be held every other month. For this month, we will be having the Carnival on Mother's Day - May 8, 2011. 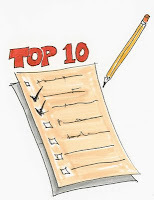 Topic for May will be a Breastfeeding Mother's Top Ten - think of any list of 10 you'd like to talk about. It could be the 10 gifts to a new mom, 10 benefits of breastfeeding, 10 myths of breastfeeding, 10 things you shouldn't say to a nursing mom, 10 places you've nursed in public, 10 problems with breastfeeding, 10 steps to successful breastfeeding, 10 tips to new moms, I could go on and on - but I hope you get the picture! Read my March Carnival post to get an idea on how a blog carnival post looks like. To join the carnival, please fill up this FORM and include the topic you will write about. We will try to avoid repetition of topics or top 10 lists so the earlier you fill up the form, the earlier you ensure that you will be able to write about your topic. In case your preferred topic has been chosen by another participant, we will email you immediately to request you to change your topic. Otherwise, we will contact both participants so even if they will write about the same top 10, they can choose different items on the list. Please include this short blurb on the top of your post: "Welcome to the Milk Mama Diaries Carnival (May). This carnival is dedicated to all moms, celebrating Mother's Day today. Participants will share various topics covering A Breastfeeding Mother's Top Ten List. Please scroll down to the end of this post and check out the other carnival participants." If you don't have a blog but would like to join, please email me or Mec so we can arrange to have you hosted as a guest blogger. Submissions are due by 4 May 2011 and the carnival will go live on 8 May 2011. My co-host Mec will email you before carnival day for instructions on posting.